Even more than WTF, Paul Gilmartin’s wonderful, essential podcast Mental Illness Happy Hour goes deep with its interview subjects. After a really good episode of the podcast, you feel like you know the guest on a profound human level. You feel like you’ve gone on a journey with them through their lives and their dysfunction, and, God willing, come out alright on the other side. The podcast doesn’t just invite intimacy – it all but demands it. Honesty and unwise candor are the price of entry. It’s not the kind of podcast where you can just promote a new project – no, you have to bare your soul or you’re on the wrong podcast. 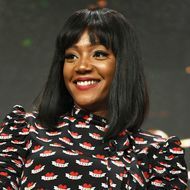 That’s certainly true of a mesmerizing episode with actress, author, and comedian Tiffany Haddish, which was recorded in 2015, well before she began her incredible, Girls Trip-fueled ascent to superstardom. Haddish’s star-making turn in Girls Trip helped make her one of the hottest actresses and comedians around. She’s breathing rarified air these days, hanging out with Beyonce, costarring with Tracy Morgan on the TV show The Last O.G., and co-headlining the film vehicle Night School with Kevin Hart. How successful is Haddish? This year Time magazine named her one of the 100 most influential people in the world. That, friends, is what you call a goddamn rocket ride to superstardom, but when Haddish visited Gilmartin’s office to do Mental Illness Happy Hour he had to go to Wikipedia to get information about her and she was hoping to line up work warming up audiences, a job that would draw on her natural ability to work crowds into a frenzy, as she did during her long stint getting people excited at bar mitzvahs as a teenager. It seems safe to assume that being an international movie, television, and standup star suits Haddish better than helping get audiences pumped up to laugh at The Goldbergs. A strong, assertive, black female Jewish survivor of horrific physical and psychological abuse, Haddish has certainly not had an easy go of it. Her charismatic con man father abused her mother before abandoning the family. Haddish’s mother was a remarkable human being and larger-than-life figure of Shakespearean strengths and weaknesses, a strong-willed businesswoman who nearly died in a car accident that left her with horrible brain injuries and schizophrenia. She was a woman the young Haddish looked up to and admired despite being a violently abusive, deeply mentally ill woman convinced aliens were descending upon the planet to sexually assault people en masse. Haddish heartbreakingly conveys the incredible sense of vulnerability and powerlessness that comes with being a child in a chaotic and abusive environment where the only stability and security in your life is the kind you’re able to create for yourself. Through it all, Haddish has extraordinary compassion for the strong, smart, and resourceful little girl she used to be as well as a mother who was a vicious abuser but also a victim who had endured things no one should have to experience. Haddish held onto her humanity and her sense of humor throughout it all. She didn’t just survive the kind of abuse that would destroy lesser souls – she’s thrived. She conquered. Instead of destroying her, the madness and the melodrama of her early life helped make her strong as well as kind and wise. Early in the episode, Haddish jokes that her life is a Lifetime movie. She’s selling herself short: Haddish’s tragicomic but ultimately inspirational and life-affirming triumph over adversity has the makings of a wildly cinematic melodrama, albeit one much too good for Lifetime, particularly since the role of Haddish’s mother, one she quite literally was born to play, screams “Oscar.” Possibly even more so than her role in Girls Trip.